Online transactions are continuously growing but why do more and more people buy online? E-Commerce is growing at an unprecedented rate all over the world. People from every age whether they are children, millennials, or old loves to shop from different e-stores. 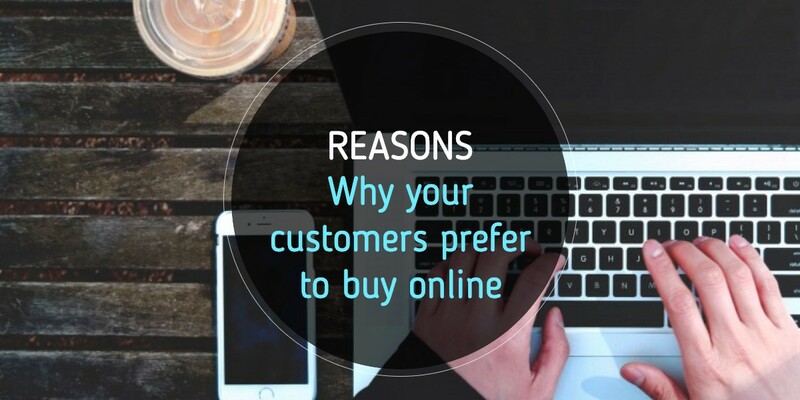 Let’s look at the reasons why they prefer to buy online even after coming to retail stores. Currently having an online store has become a hygiene for any shopping store business. Your consumers are more confident in buying when you provide omnichannel experience to your consumers. Your customers don’t have to wait in a line or wait till the shop opens next day and assistant helps you with your purchases. Your customers can shop online anytime even if they are busy or even at midnight. It is easy to compare products and services. Due to price transparency, prices of products and services can be lower online than offline. Consumers like to read about experiences from other buyers. This strengthens them in their decision to buy a certain product. Customers can get several products from different sellers at one place. With different color, material type filters it is easy to search for product what your consumers are looking for. When you are not paying any rent for your multiple physical stores and easy options to add deals and promotions. Consumers always have an eye to get promotions and tend to buy more and more products from your web store. With new level of personlization you can offer customer specific discounts and offers to get their loyalty towards your brand. Buying from retail store doesn’t come with just product prices, It also includes other expenses such as parking costs, eating out, traveling, impulsive shopping. People tend to think ordering online saves time and they can decide from the comfort of their homes. Moreover it is about the experience which you provide and gain the trust of your consumers. To make it simpler we have introduced CommerceUp. Using CommerceUp you just need to focus on your operations and business and leave the technology involved with us.